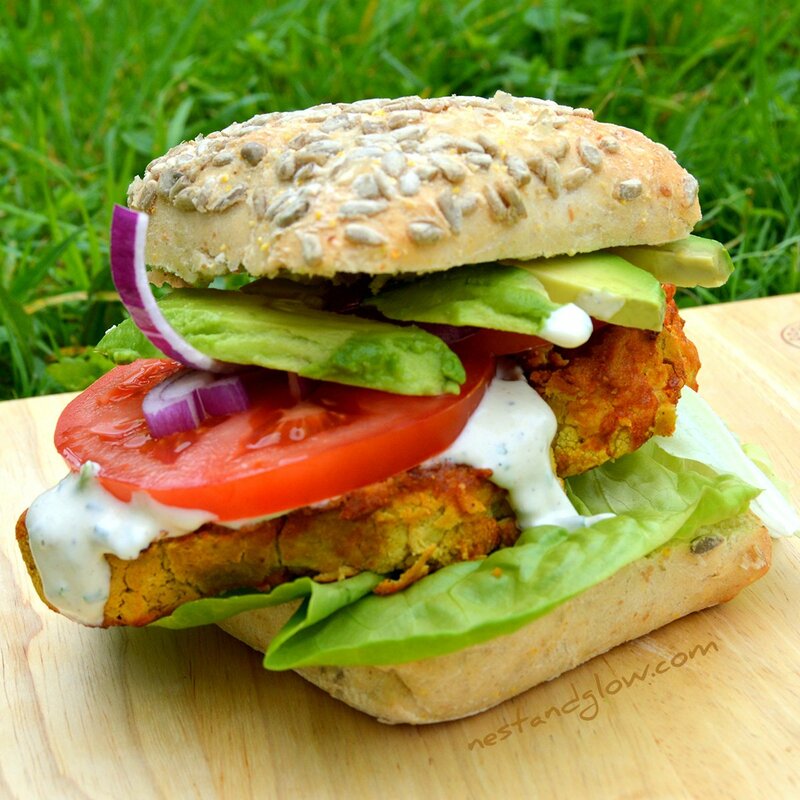 Simple cauliflower burger recipe with a spicy chickpea coating that’s naturally gluten-free. These meat-free vegan burgers are easy to make, hold together firm and require no shaping. Slices of cauliflower are dipped into a chickpea and cayenne coating to add flavour, protein, texture and crunch. Suitable for gluten-free, grain-free, paleo and vegan diets. I’ve served the simple cauliflower burger in a seeded gluten-free bun loaded with little gem lettuce, tomatoes, raw ranch, red onion and avocado for the photos. The gluten free bun was bought from a local shop and was a rice, potato and corn sourdough blend. 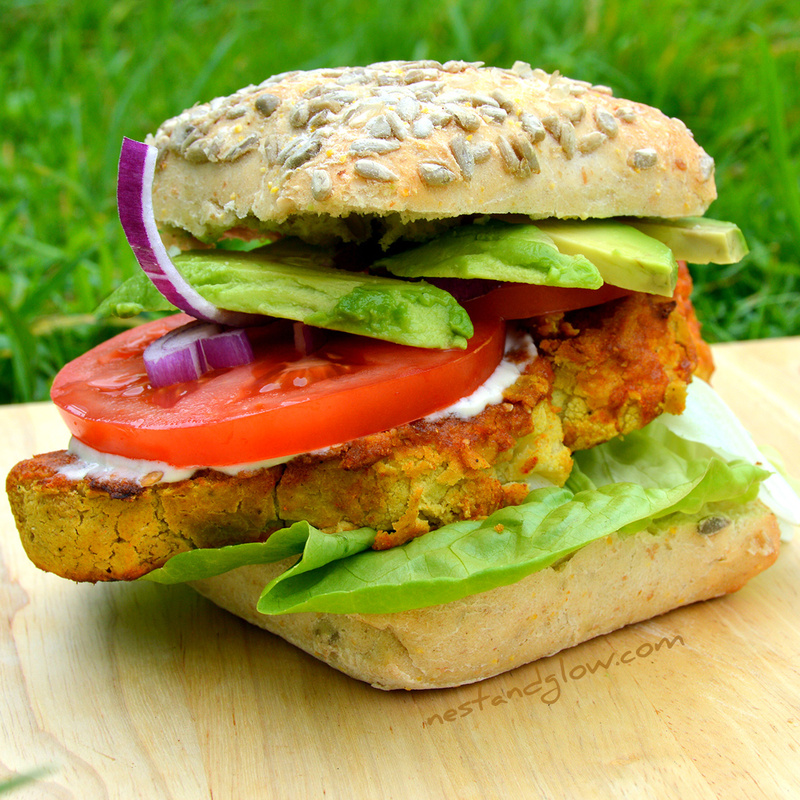 I have got a recipe for quinoa burger buns if you fancy making your own high protein gluten free bread for a burger. Also works well loaded with a mixture of tomato puree and apple cider vinegar and slices of pickled gherkins. The burger is double baked and might seem like a lot of effort. But it’s really much easier than most other recipes as no steaming, blending or shaping is needed. It also won’t fall to bits when you eat it like many home made vegan burgers do. Don’t be put off that the total time is over an hour to make the cauliflower burger as most of that is the oven doing the work while you sit back. You can if you like make several of these burgers and freeze some for later. It’s not a recipe that can be done quickly when you are hungry – it’s more of a Sunday afternoon when you’ve got the time and want a healthy burger. This recipe is a variation on my Gluten-free Cauliflower Wings recipe. If you are not wanting a fully loaded burger then try the simpler recipe. You may want to make the end pieces of the cauliflower into vegan “wings”. 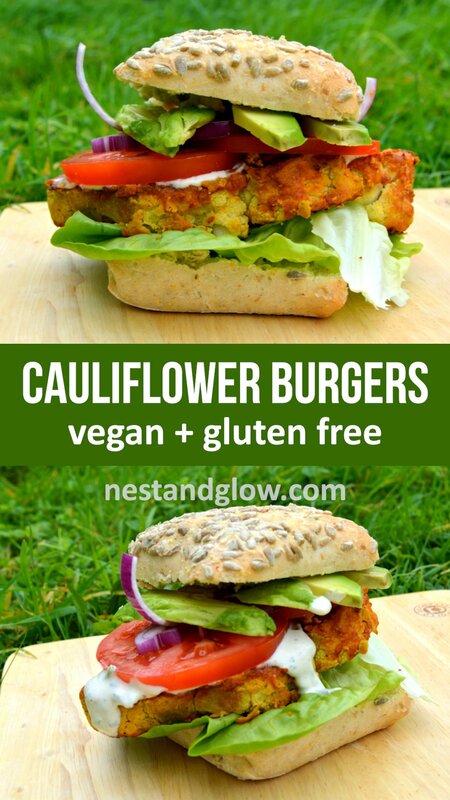 With a whole cauliflower you can get between 4-6 cauliflower burgers before it starts to fall to bits. A standard cauliflower gets 4 slices, a small one gets 2 burgers and a monster one that I get from a Turkish supermarket gets 6 slices! You need to be able to get some of the stems into the cauliflower burger slice for it to stay together. These simple cauliflower burgers have a great texture that while the won’t fool anyone that they are meat they do a good job at filling the void. Another way to serve this burger is in grilled giant mushrooms with a sprinkle of sesame seeds. We are often told to avoid white foods like bread and sugar as they contain no nutrition. While cauliflower might be white it still contains just about every vitamin and mineral that we humans need. Pre-heat the oven to 450F / 230C. Put all of the chickpea batter ingredients for the cauliflower burger into a blender and whizz until smooth. You may need to add more water. Chop one medium cauliflower into slices. Dip all of the cauliflower slices into the chickpea batter and coat. Shake off the excess and place on a non stick sheet and bake for 30 mins until golden. Turn over halfway through. Repeat steps 3 and 4 for the chilli batter to coat the cauliflower burgers again and bake. Again take out of the oven after about 30 mins once the healthy burgers are golden. To make the raw ranch dressing blend everything apart from the basil and chives until smooth. Then stir in the chopped herbs. Enjoy immediately in a loaded bun or store in the fridge where they will last a few days. The oil is optional for the cauliflower burger coating. It helps to give a crispier coating but is still delicious without it. Use a high smoke oil like light olive oil if you want to use oil as its healthier to cook with. To make this nut free replace the cashew nuts in the dressing with sunflower seeds. The apple cider vinegar can be replaced with white wine or rice vinegar, but add slowly after blending as the amount may need to be adjusted. Put less chilli or cayenne pepper in for a milder version. These are best served hot straight out of the oven. 1 tin of chickpeas is about 15oz or 400ml when undrained. These look amazing! Love the idea and that it doesn’t use any flour. I can’t eat wheat so this is great. Lawd! I can’t wait to try this!